Michael Jackson's estate is suing HBO for $100m (£77m) over the controversial documentary Leaving Neverland. A complaint filed at Los Angeles Superior Court on Thursday read: "Michael Jackson is innocent. Period." In response, HBO said it would not only still air Dan Reed's documentary, but bring it forward by several days. "Despite the desperate lengths taken to undermine the film, our plans remain unchanged," the channel said. "HBO will move forward with the airing of Leaving Neverland. This will allow everyone the opportunity to assess the film and the claims in it for themselves." The broadcaster will now screen the four-hour documentary on 3 and 4 March. 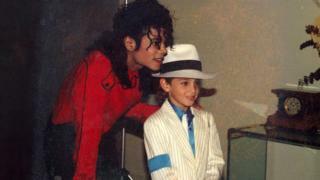 The film tells the stories of Wade Robson and James Safechuck, who claim to have been sexually assaulted by Michael Jackson in the 1990s as children. It has been criticised a number of times by the Jackson estate since it was first screened at the Sundance Festival in January. They called it "an outrageous and pathetic attempt to exploit and cash in" after the singer's 2009 death. It has also been criticised by individual members of Michael Jackson's family, including Jermaine Jackson, who told ITV's Good Morning Britain there was "no truth" to the allegations made in the film. The legal action refers to a contract to televise a concert from Jackson's Dangerous tour in 1992. The contract included a clause saying HBO would "not make any disparaging remarks" about the pop superstar. Channel 4, which co-produced the documentary with HBO, has previously rejected a complaint made by the estate, who said it broke the British broadcasting code. The documentary is set to be screened in the UK on Channel 4 on 6 and 7 March.